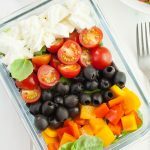 This Easy Lunch Box Caprese Salad is a fantastically simple no-cook lunch box salad that is full of the good stuff, contains no nasties at all and is interesting enough to keep you making it week after week. I don’t know about you, but I find it really hard to be inspired when it comes to lunch box ideas. 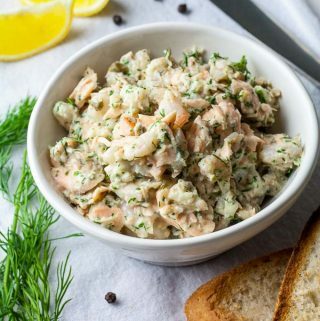 I’m not the world’s biggest sandwich fan and anything that takes too long to make is completely out, but I find that this salad is more than interesting enough for me to take to work week after week and it’s a really good way of using up any left-over salady bits or meat. Is this a true Caprese salad? No! A true Caprese Salad is a combination of mozzarella, tomato and basil and is an Italian classic. 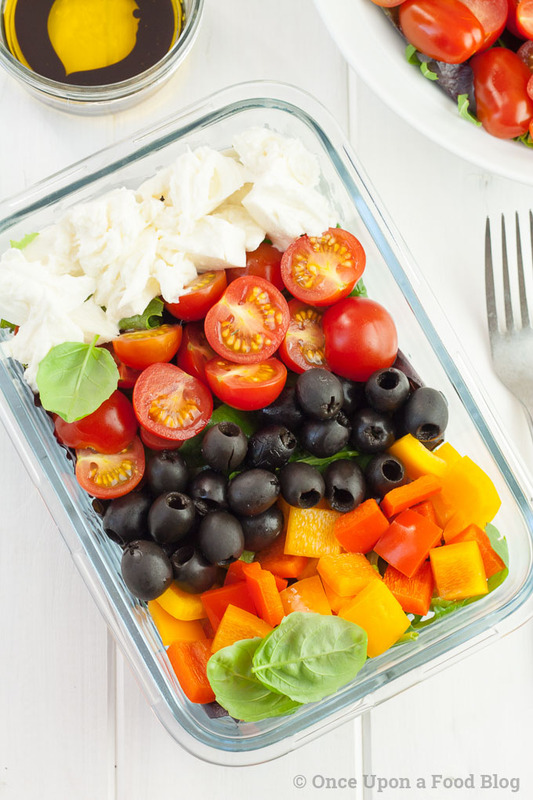 I’ve added salad leaves, peppers and black olives, because I like them, they help bulk the salad out and they add some interest, but I do love the tomato, mozzarella, basil element so I’ve borrowed the name! Feel free to do as you please here. So, can I switch things up with this salad? Absolutely! There are loads of ways to vary the ingredients. 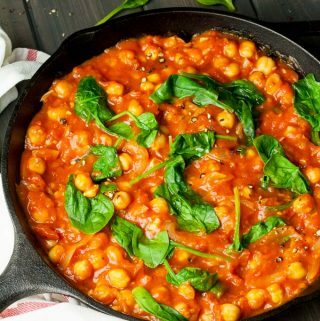 Why not try adding in some left-over chicken or sausage or some prawns or tuna. If you want to keep it veggie then you could add some hard-boiled eggs or even go vegan with artichoke hearts and avocado. Other things I add to keep things interesting are capers or sun-dried tomatoes. I sometimes swap the olives to green, use parsley or chives in place of the basil or add in some toasted pine nuts. 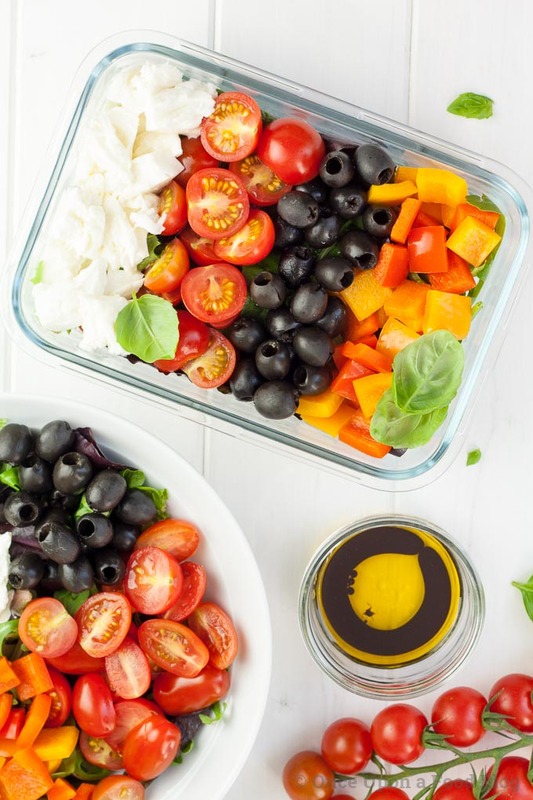 Dressing – Go with what you want here but I love the olive oil/balsamic vinegar combo. I use loads (about 50ml olive/basil oil and 20ml balsamic vinegar) but use as much or little as you like. If you want low fat and low carb then try soy sauce. It’s surprisingly good! 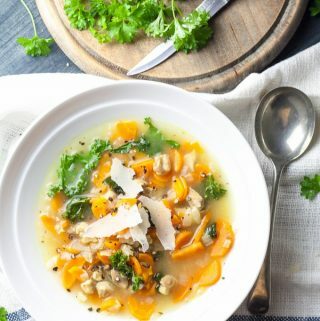 If you’re looking at this and thinking ‘where are the carbs?’ then why not serve a bread roll on the side or add in some left-over pasta or boiled potato. Couscous, quinoa and cooked lentils would also work really well here. The salad is quite big, so you may wish to reduce the size of it a bit if adding in carbs. As I’m sure you’ve worked out, if you’ve got it in and want to try it then do. My usual switch is to add in a couple of hard-boiled eggs in place of the mozzarella. I absolutely hate hard-boiled eggs with a dry, powdery yolk but love them with a soft, barely set yolk. Here’s how I cook them. Pour 2-3cm cold water into a small pan, put the lid on and bring the water to the boil. When the water is boiling, gently lower in the eggs using a dessert spoon, put the lid back on and start the timer. When the water returns to the boil turn the heat down so that the water is simmering. When the timer beeps, drain the eggs and immediately place under the cold tap for a few minutes to cool. For a soft, barely set yolk you will need to cook medium eggs for 6½ minutes and large for 7 minutes but you may want to experiment here to get the yolk to the texture you like – just don’t think that a hard-boiled egg has to have a dry powdery yolk! Do you have any other salad recipes I can try? Absolutely. I love my Teriyaki Salmon Salad Bowl and my Puy Lentil and Sundried Tomato Salad is also a meal in itself. 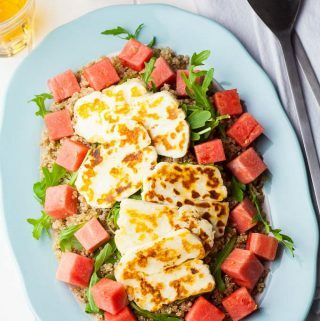 My Watermelon, Halloumi and Quinoa Salad and my Orange, Feta and Olive Salad would also make brilliant lunch box salads. My 5-a-day challenge is going Ok but what I really need to do is make a list of the remaining fruit and veg that I’ve committed myself to get into my diet on a semi regular basis. I also need to record when everything is in season so I don’t miss anything. Gooseberries (childhood memories of sour crumble – need I say more), broadbeans (ugh), marrow (ditto), spring greens (I just never bother), turnip, yellow lentils, lychees, papaya, figs, prunes, and damsons. 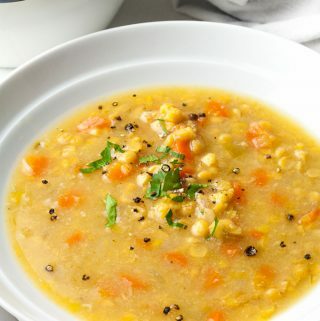 I do like yellow lentils, lychees and papaya but just never get round to eating them, so I’m looking forward to eating more of them, but I might have to look for a little inspiration for the others. What about you? What are your fruit and veg nemesis. Or perhaps you have a recipe that you think could convert me to one of mine? Let me know in the comments below. Place the leaves into the bottom of your lunch box. Top with the pepper, tomatoes, olives, mozzarella and basil leaves. Measure the dressing ingredients into a separate container and store separately. Feel free to change things round. 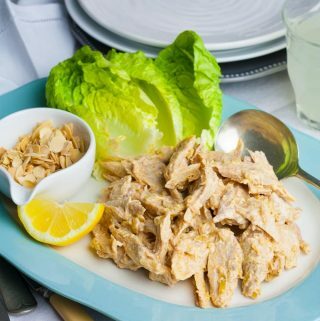 Protein – Try left over chicken or sausage, some prawns or tuna, keep it veggie with hard boiled eggs or go vegan with artichoke hearts and avocado. 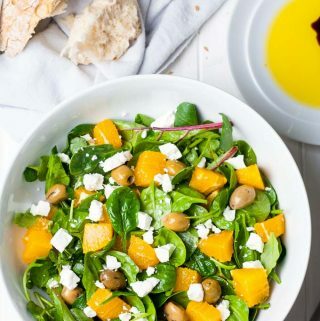 Flavour – Add some capers, swap the olives to green, add sun dried tomatoes, use parsley or chives in place of the basil or add some toasted pine nuts. 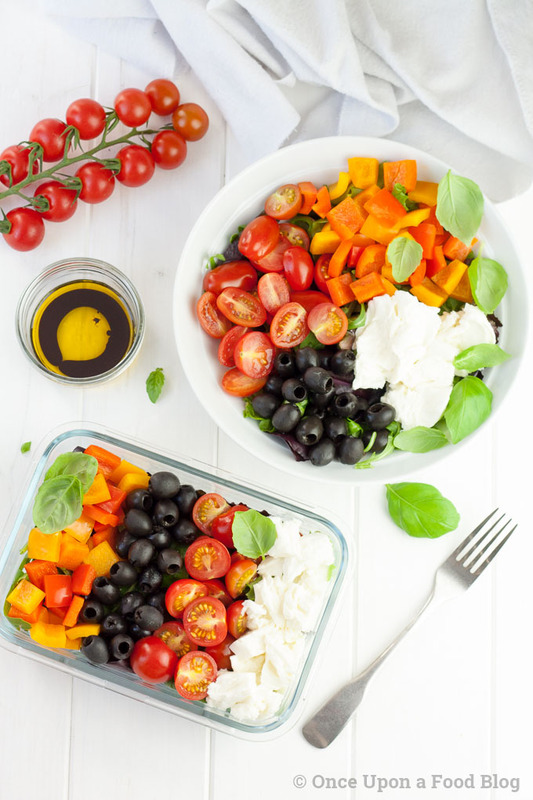 Dressing – Go with what you want here but I love the olive oil/balsamic vinegar combo. I use loads (about ml olive/basil oil and ml balsamic vinegar) but use as much or little as you like. If you want low fat and low carb then try soy sauce. It’s surprisingly good! Carbs – Serve with a bread roll on the side if you wish, or add in some left over pasta or boiled potato. Cooked quinoa, couscous or lentils would also work well. The salad is quite big, so you may wish to reduce the size of it a bit if adding in carbs. Those colours are absolutely stunning – your photos are absolutely gorgeous! Looks so colourful, I could eat this salad every day! 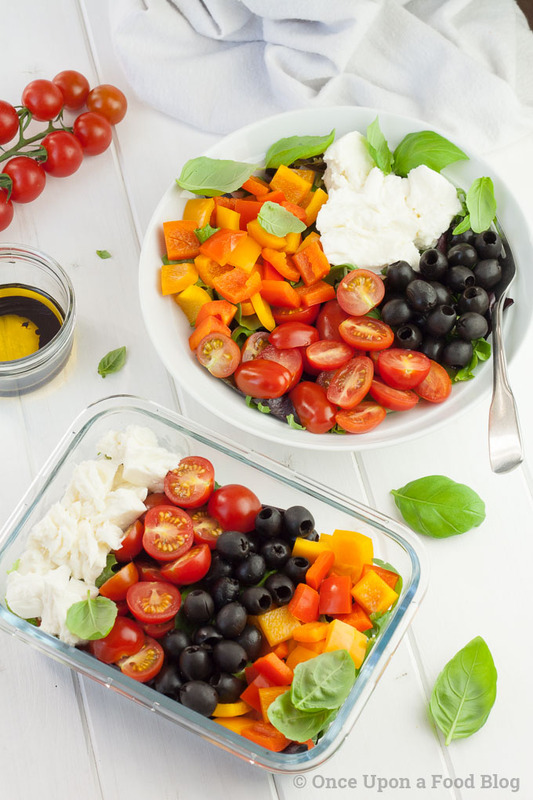 Anna, this caprese salad looks fabulous! 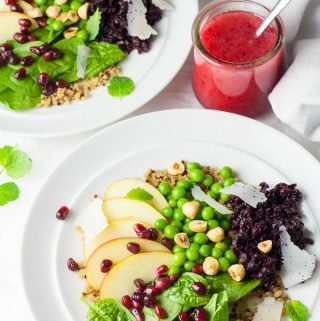 So refreshing and flavorful A perfect lunch!